Hi Everyone, I hope you’re all well. Today’s blog post is on what could be considered a controversial topic, ‘What Makes a Good Blog?’ so I just want to add a little disclaimer before I start. 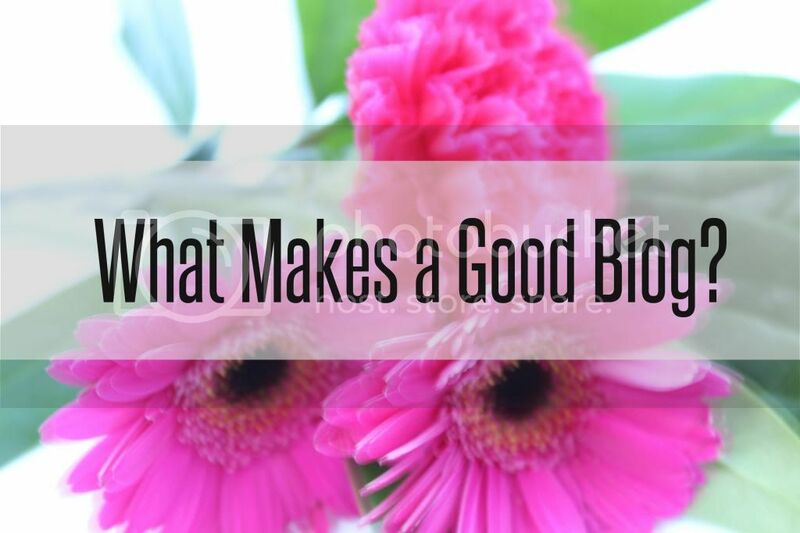 There is an endless list of things that makes a good blog and this blog post just features a few that I personally think are important. I’m not saying that this is the only way to do things or that it is the best way, it’s just what I look for in a blog. Let’s get started. There are thousands of blogs about beauty let alone on fashion, food and other areas so I think one of the most important things you can do when blogging is to be yourself. If can take some time to establish yourself and work out your writing style, type of posts, and pictures etc but one thing that really draws me to a blog is when I can see someones personality shining through. It makes it more interesting and enjoyable to read because I can relate more with the writer and it makes their blog unique. When I’m reading a blog I find it pretty easy to tell if the writer enjoys it because thought and enthusiasm goes into their blog posts, they are passionate and their posts are a good length. We have all times when we are busy or not quite in the ‘zone’ to write and I think when this happens it’s best to take a step back and not force yourself to write your posts otherwise I do find it can come across to the reader. I think having fun and enjoying what you do is imperative. This is a tough one because photography is a huge area and personally I think it is something which takes time to learn. I have had my blog for around 13 months now and I’ve only just got to a point where I am happy with my photo’s. It just goes to show with a little patience and time you can improve massively and even if your photo’s aren’t the best if they are large, show off the product and are crisp you are onto a winner. There is a saying that ‘content is king’ and I definitely agree with this statement. It’s all well and good having an amazing layout, promoting your blog and having lots of pictures but something which is equally important is the content of the actual blog posts your readers will be looking at. The blogs I love to read and follow have a variety of blog posts (reviews, tutorials, fashion, lifestyle, food etc) so there is always something different, they post regularly, their posts have minimal spelling mistakes and there is plenty of detail. For me there is nothing worse than reading a post about a product which doesn’t cover the essential information. There are so many beautiful layouts in the blogosphere and I absolutely love to see how different they are all. You guys are all so creative and I love how people have a theme and make their layout unique to their personality. My favourite layouts are simple, neat and use minimal colours as I’m not a fan of busy layouts that make it hard to read text. Communication is a key part of blogging and for me the best blogs do this regularly. It is so lovely to see that comments are replied to on posts, emails are responded to and tweets acknowledged. It makes me think the writer really appreciates what the readers have to say and it also gives you a chance to get to know people a little better. I haven’t got a huge amount to say about advertisements other than to keep them to a minimum. Personally, I am put off when there are lots of pop ups and advertisements getting in the way of blog posts and making them hard to read. I think the odd one in a side bar, between posts or at the top or bottom of the page is fine because they are subtle but if they prevent me from reading the actual blog, which is why I visited, then I don’t stay for long. This was really helpful- thanks!